President Clinton lineage information can help you learn more about the life of the man who was the 42nd President of the United States. Bill Clinton served as president from 1993 until 2001, making him the first Democrat since Franklin D. Roosevelt to win a second term in office. Clinton was born William Jefferson Blythe, III on August 19, 1946 at Julia Chester Hospital in Hope, Arkansas. As a young man, Clinton was an excellent student and an accomplished musician. He earned a B.S. in Foreign Service from Georgetown University, studied at Oxford on a Rhodes Scholarship, and earned his J.D. from Yale Law School. 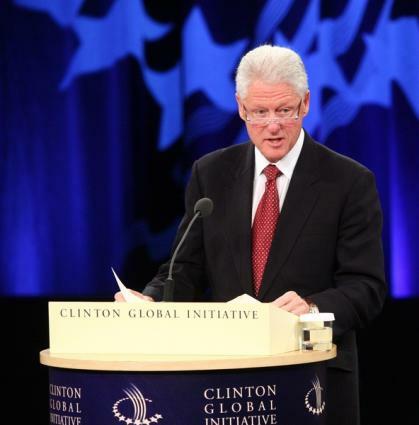 Bill Clinton has often said that two moments contributed to his decision to pursue a career in politics: meeting President John F. Kennedy while participating in the Boys Nation program and listening to Martin Luther King's I Have a Dream speech. Bill Clinton's family tree is quite complicated, due to multiple marriages within the family. Bill Clinton's paternal grandparents were William Jefferson Blythe, Sr. and Lou Birchie Ayers. They were farmers in Texas. Clinton's maternal grandparents, James Eldridge Cassidy and Edith Cassidy, were the owners of a small grocery store. Their business was unique in that they extended credit to people of all races at a time when the South was heavily segregated. They cared for Bill Clinton for a brief period shortly after his birth so his mother could finish nursing school. Bill Clinton's father was William Jefferson Blythe, Jr., a traveling salesman who was killed in an auto accident three months before Clinton was born. Although he was just 28 at the time of his death, his marriage to Clinton's mother was his fourth marriage. His previous spouses were Virginia Adele Gash, Fannie Maye Gash, and Wanetta Ellen Alexander. However, Clinton's mother was not aware of these previous marriages until nearly 50 years after the fact. Clinton's mother was Virginia Dell Cassidy. She worked as a nurse anesthetist, the same career her mother had chosen. She met Clinton's father when he visited the hospital she was studying at with a minor medical ailment. Even though she was engaged to her high school sweetheart at the time, she was immediately taken with his charm and good looks. Roger Clinton was the co-owner of an automobile dealership. Roger Clinton was a gambler and an alcoholic and was frequently both verbally and physically abusive towards his family. However, he was essentially the only father Bill Clinton knew as a child. William Jefferson Blythe, III choose to formally take his stepfather's surname at the age of 14. Jeff Dwire was a hairdresser. His marriage to Virginia lasted until his death from complications of diabetes. Richard Kelley was an executive at a food distribution brokerage firm. His marriage to Virginia lasted until she passed away from complications of breast cancer. William Jefferson Blythe, Jr. had two children from previous marriages: Sharon Lee Blythe and Henry Leon Ritzenthaler. These half siblings are a relatively unknown part of the President Clinton lineage. In My Life, Clinton says that he did not know about his older half siblings until 1993. He has never met his half sister, but has corresponded with Ritzenthaler on various occasions. Virginia Dell Cassidy gave birth to Bill Clinton's younger half brother Roger Clinton, Jr. in 1956. An actor and musician, Roger Clinton got his start singing for the studio audience for Designing Women. He has appeared in television shows such as The Nanny, Sabrina the Teenage Witch, and Cybill as well as movies such as Pumpkinhead II: Blood Wings and Fred Claus. In 2001, Roger Clinton was pardoned by his brother for a 1985 cocaine possession conviction. This was part of the 140 pardons Bill Clinton issued during his last day in office, many of which were considered controversial. Bill Clinton is married to Hillary Rodham Clinton. The couple began dating while attending Yale Law School and were married in 1975. As Bill was preparing to leave the presidency in 2001, Hillary was launching her own political career. She served as United States Senator for New York from 2001 to 2009 and was a leading candidate for the Democratic presidential nomination in 2008. In January 2009, she assumed office as the Secretary of State. Bill Clinton has one daughter, Chelsea Clinton. She was born February 27, 1980. Chelsea Clinton married investment banker Marc Mezvinsky on July 31, 2010. The family relationships of the Clinton family offer insights into the life of this famous political figure. For more information about Clinton's ancestry, check out Famous Kin.